Quick answer: For Bareroot (shipped tree customers) a hole, soil removed 3′ diam. x 1′ deepput back in with a lot of water- like a soil “soup” gently filling all the air voids, add compost to mulch. Now that you will be planting your new trees, you should take a few moments to consider how you will plant them so they are provided with the best possible conditions for their first year of growth. A little effort now will be rewarded later with fine healthy trees. When selecting a site to plant your new trees, consider the spacing required between trees. Trees grafted on semi-dwarf rootstocks (EMLA 26, EMLA 7, EMLA 111) should be planted no closer than 12 feet apart. Dwarf ( bud 9, mark, EMLA 27, p22) trees can be planted 3 to 6 feet apart but require permanent staking to support the tree. The site should receive 6 to 8 hours of sunlight daily. A site that is mostly shaded will produce thin, weak trees. Be sure the soil is well-drained. Glacial compaction is common and in most cases planting on a mound is necessary. 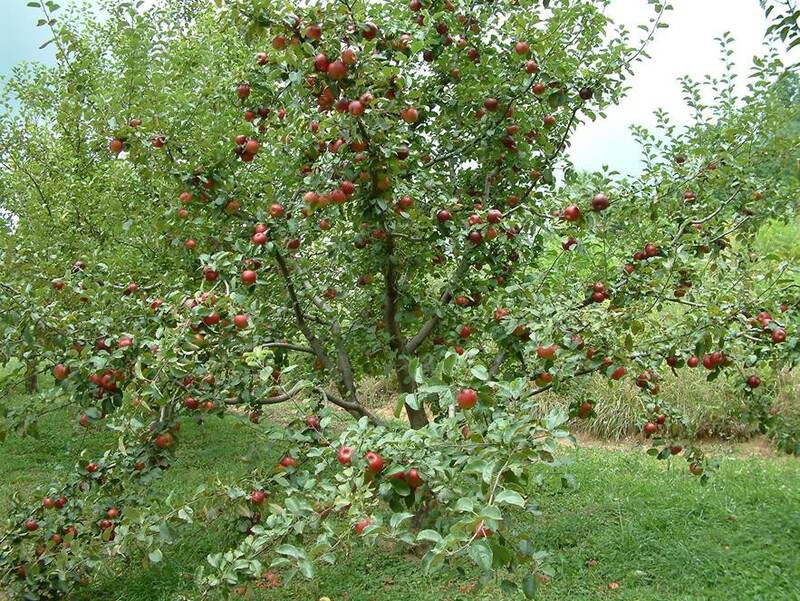 If you have purchased several trees to plant in a small orchard, plow or till the orchard mixing in ten pounds limestone and 1/2 yard manure per 100 square feet. Adding rock powders for mineral health at this time is generally a good idea. Adding 10# each per 100 s.f. : Rock phosphate, granite dust, greensand, azomite-Steubers in Snohomish have all these. After planting keep the small tree free of grass and weeds and plant a guild of beneficial plants such as clover, comfrey, horseradish, taprooted umbels like carrots, parsnip, parsley and dill. A 3 to 4 foot wide area cleared of competing weeds (grass is most competitive) around each tree will ensure vigor. If planting just a few trees, prepare your site a few weeks before planting, if possible, by spreading three pounds of limestone and two pounds of bonemeal over the site for each tree. Till or plow the site to a depth of at least six inches. Bonemeal is an excellent source of phosphorous, an essential element for root development. For each tree, dig a hole 2 feet wide and 12-18 inches deep. The best transplanting method is to place the excavated soil into a wheelbarrow and then sprinkle one cup each of limestone and bonemeal over this soil. Use your shovel to thoroughly mix the lime and bonemeal into the soil in the wheelbarrow. Partially refill the hole with enough of the mixed soil to bring the tree up to the proper planting depth. The tree should be planted so that the graft union is at least 2 to 4 inches above the final soil line. Remove the tree from its plastic pot and gently shake off half the soil from the roots. (This does not apply to shipped trees. Shipped trees have a small amount of soil on the root ball and are ready to plant). Place the tree in the hole, gently spreading the roots over the bottom of the hole. Refill the hole with the remaining soil, tamping-down the soil firmly as you refill. Water the hole thoroughly as you are refilling and tamping. A small amount of well-rotted compost can be added to the hole if available. Mulching your trees after planting is highly recommended. Apply a 4-6 inch thick layer of pine or hardwood bark, pine needles, leaf mulch, or similar weed-free material in a ring around each tree. Keep the mulch pulled a few inches away from the base of the tree to discourage mice and voles from gnawing on the lower trunk. Add more mulch over time as it decomposes and make a diligent effort to prevent weeds and grasses from becoming established around the tree for the first few years. It is also important to provide sturdy stakes for dwarf trees. A ten-foot metal or wooden pole buried two feet in the ground will work very well as a supporting stake. As mentioned, mice and voles can injure young trees, but they are minor pests compared to the damage inflicted by rabbits and deer. A deer or rabbit can destroy a tree in a matter of minutes, so certain precautions should be taken if you live in an area with healthy populations of these creatures. Rabbits like to chew tender bark and can easily girdle a tree with their feeding. An easy preventative measure is to enclose the lower 18 inches of the tree in a small wire cage of hardware cloth, screen wire, or fencing material. Another possibility is the use of plastic corrugated drain pipe, cut into 18 inch lengths, then cut up the length of one side. The pipe can then be easily spread open and wrapped around the lower part of the tree. For deer control, fencing is required. 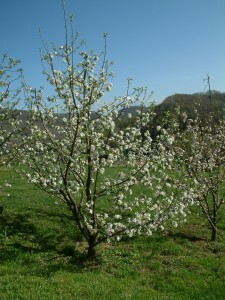 For orchard plantings, the best option is to erect an eight foot high fence around the entire orchard. A combination of field fencing and barbed wire works quite well. This can be labor intensive, but is the only method to prevent deer from entering the orchard. For individual tree planting, a four to five foot high woven wire fence can successfully deter deer from munching on the tree. Wrap the fencing six to eight foot diameter around the tree and anchor well to the ground >3 stakes. Deterrents such as soap or human hair hung in the trees can have moderate success but require constant renewal. Also, the deer and rabbits can become accustomed to the odor. Strong fencing combined with fresh deterrents should provide your young trees with the best animal protection possible. The first spring after transplanting, when your trees have put on three to six inches of new growth, select one strong green shoot at the top of the tree to be the new central leader. Remove all new shoots for 4 to 5 inches immediately below this new leader. Removal of this growth reduces competition with the new central leader and encourages the development of new shoots in a zone 6 to 12 inches below the cut tip of the tree. These new shoots will develop into the tree’s first lateral branches, or scaffold limbs. In addition, remove any growth on the lower eighteen inches of the trunk. Your tree should now have one terminal shoot to form a new central leader, an eight-inch zone of new shoots to form the first scaffold branches, and an 18 to 22-inch area on the lower part of the tree cleared of new growth. When the first whorl of scaffold branches is 4 to 8 inches long, select 3 to 5 of the best looking branches to be the first permanent scaffold. Spread them to a 70 to 80 degree angle using toothpicks or clothespins. This will encourage wide crotch angles on the branches making them much less susceptible to breakage later on in the tree’s life when it begins to bear fruit. Continue to keep the lower 18 to 22 inches of the trunk free of shoots and buds. The soil pH (level of acidity) for apples should be in the range of 6.0 to 6.5. Most soils are far too acidic for good growth and must be limed to achieve the proper pH level. Once your trees are established, applications of lime every 2 to 3 years will maintain the correct soil acidity. 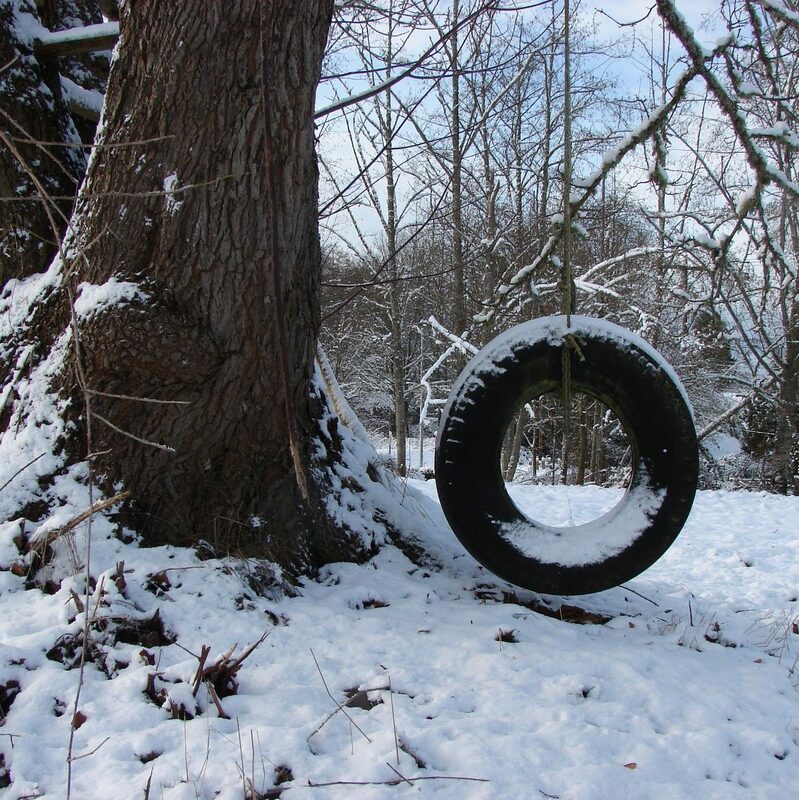 For young trees, one pound of lime applied in a broad ring around the tree will be sufficient. Spread the lime out from the trunk to just beyond the drip line of the limbs. Increase the lime applications as the tree matures up to a maximum of 5 pounds for a mature bearing-age tree. In some areas the soil will already be quite basic in nature ( pH 7.0 or higher), such that the addition of limestone will be counterproductive. Regions rich with natural underlying limestone are such an example. In these soil types the incorporation of elemental sulfur will assist in lowering the pH to a range suitable for growing apple trees. The addition of aluminum sulfate can also be used to lower soil pH but must be used with discretion to avoid buildup of aluminum to toxic levels. Please consult your county agricultural extension agent for more information. Fertilize your apple trees three times a year beginning in March, again in early June, and finally in July. (In colder agricultural zones with shorter growing seasons fertilize your trees twice a year – April and June.) Do not fertilize in late autumn as this will stimulate tender, late season growth which could be injured by winter’s cold. When selecting a fertilizer, be sure it is a balanced type (8-8-8). The general rule-of-thumb is to apply one pound of fertilizer per year of age of your tree up to a maximum of 5 pounds for a mature tree. Skipley farm uses chicken manure-about 5#/tree. As with the lime applications, spread the fertilizer out to the drip line. If nutrition levels and soil pH are correct, then you should expect your young trees to produce 16-24″ of new growth per year. If the rate of growth is significantly less than this, collect a soil sample for analysis and amend the soil as necessary according to recommendations. Soil sample boxes and information on how to collect samples are usually available free of charge from your local county extension agent.